4 Rings Tactical is based in Boulder, Colorado. Adult and youth classes meet every Wednesday at Zenko Kuydojo. Class is held at the dojo located at the back of property; park across the street at Crest View Elementary School. Classes are $15 for drop-in or $65/month for unlimited. Instructors Vajra Granelli and Maya Fleigel also teach regular classes and specialized intensives at other locations, all of which are listed on our calendar. We consider martial arts a complete spiritual path. We believe that martial arts also complement any spiritual or secular tradition. With mutual kindness, mindfulness, and discipline, we work directly with others during our training, and thereby physically and mentally ground our innate compassion and fearlessness. We focus on the arts of Aikido, Brazilian Jiu Jitsu, Muay Thai, and Kali. Each of these emerged from Eastern warrior traditions, and we strive to highlight the unique nobility, wisdom, and skills of each. Our classes begin with mindfulness practice and conclude with active reflection; clear communication and body-awareness are emphasized throughout. In this way, we practice skillful engagement with others while developing an intimate knowledge of ourselves. Through practice, we become familiar with our inherent virtues: generosity, patience, perseverance, compassion, fearlessness, etc. Through the kind assistance of our teachers and fellow students, we learn to magnetize these virtues in ourselves and others and develop them further. 4 Rings Tactical focuses on the embodiment aspect of the 4 Rings Collective. 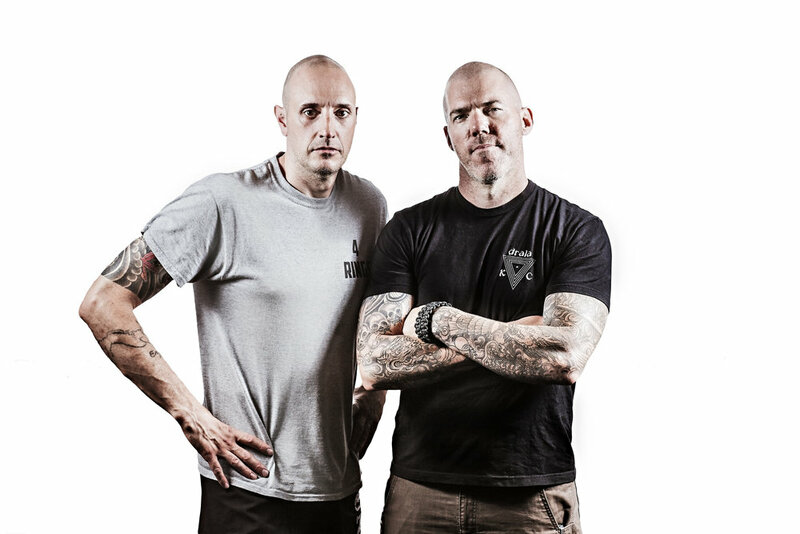 Vajra Granelli and Robert Lee founded 4 Rings in 2014 primarily as a way to explore warriorship and spirituality through martial arts. The friends quickly realized, however, that to be a genuine "warrior" in today's society requires much more than mindfulness and fighting skills. Robert and Vajra therefore expanded their vision of 4 Rings to include other somatic practices, ancestral skills, wilderness awareness work, creative endeavors, social engagement, group process work, and the other aspects of the ever-growing 4 Rings Collective. We seek to live fully grounded in our bodies. Martial arts and somatic-oriented meditation are the core practices, but we also offer workshops and ongoing classes in yoga and dance. Going forward, we aspire to partner with bodyworkers of all types, actors, acupuncturists, and anyone else who views their physical work/play as a contemplative practice. From creative writing to carpentry, from music to leather working, we seek to make tangible and experiential works with our hearts, minds, and bodies. Through tracking, mindful hunting, permaculture, toolmaking, wilderness survival skills, natural attunement, and inter-species relationships, we seek to regain the wisdom and experiential richness of our more "primitive" ancestors. We seek to strengthen our bonds with all beings, but especially our human community. This manifests in social justice work, council practice, support groups, skillful listening, mindful speech, and purposeful engagement. One of the most versatile and experienced martial artists around, Vajra holds multiple black belts and teaches Aikido, boxing, self-defense, and Muay Thai in Colorado. Also a visual artist, Coach Vajra studied painting and calligraphy in China and holds a BA from the San Francisco Art Institute. He has worked extensively in executive protection and security consulting, is a firearms instructor, and has taught mindfulness to law enforcement and military personnel across the country. Read more about Vajra's training here. Maya has studied embodied movement for over 20 years, and has taught both youth and adults for the past 10 years in varied disciplines ranging from horseback riding (dressage), to yoga, to self-defense, to mindfulness-based youth summer camps. Maya completed her yoga instructor training in 2015, practicing in the lineages of Laura Pero in Limoges, France and Richard Freeman in Boulder, Colorado. She emphasises the physical sensation of the yoga practice over the level of felxibility, making yoga accessible to anyone. She studies kickboxing and Kali, and currently holds a blue belt in Brazilian Jiu Jitsu. A German native, Maya also holds a Masters Degree in psychology from a German university and has a background in nonviolent communication. Maya also writes fiction and has written three novels in German.